Ears, eyes, teeth and throat are grouped together here for convenience. All these body parts are indispensable, yet many of us do not give them their due importance. However, it is gratifying that we have specialists who can tackle problems affecting all these parts. Nevertheless, the big fact is that, if we take good care of these parts we can remain healthier and considerably reduce the frequency of our visits to doctors. I am sure all of you who read this page do have some stories to tell about the problems you faced or are facing with your ears, eyes, teeth or throat. As you read through this page, you and others whom you love will find some valuable information. The information provided here is meant to help you do your part in caring for these body parts, but does not in any way discourage you from consulting your physician. The ear is one of the most sophisticated devices gifted to us by God, hence we must take care of it for our own advantage. We often ignore the ear although it is one of the indispensable organs for keeping in touch with the living world. While we must consult our physician for any of our ear problems, we should also do our part to prevent damage to our ears through our own action or negligence. Avoid frequent cleaning inside the ear, even with a cotton bud. For most of the time, the ear does not require your intervention to keep it clean. It gets cleaned automatically. The ear canal is positioned in such a way that it is generally well protected from water or foreign objects slipping inside. However, you may get rid of excess ear wax that may come out once in a while, with your own fingers. However, if you feel there is a block, hearing impairment or pain, you should visit your doctor. You will get expert advice from your ear specialist. Noise-induced hearing loss is a major problem faced by the modern society. Any sound/noise that has a measurement of 85 decibels or more can impair your hearing if you are exposed to it repeatedly or for prolonged periods. Prolonged or repeated exposure to high decibels is reported to hurt the auditory nerves and gradually decrease your hearing ability. See NIH and CDC for further information on sound levels that can impair your hearing. If you are a music lover, avoid bombarding your delicate ear drum (tympanum) with loud sounds either through your headset or through external speakers. If you find the audio system in a hall too loud, you should excuse yourself out unless you can get the organizers to turn down the volume or muffle the sound with ear plugs. If you are a singer or an instrumentalist, do not attempt to adjust the volume controls to make your sound heard over all others. It will be jarring and cause revulsion about your performance. Music need not be a painful session of lightning and thunder, which is more primitive than modern. In those days without amplifiers, the people had to shout loud in order to be heard. But today, we have the most sophisticated sound devices which can give the best and most pleasant audibility without jarring noise. Any sound or music must be within the pleasant hearing range of our sensitive ear drum. b. use it only for the hearing of the audience within your premises. You have no right to compel others to keep hearing what is going on inside your premises. If you are a law enforcing official who has jurisdiction over noise pollution in a particular area, do by all means enforce the law without fear or favour. It is your legal duty to ensure that human ear is not hurt and damaged by noise pollution through your dereliction of duty. If you are a parent or guardian, teach your children and yourself to keep the volume of the TV or other sound making devices low. The best quality of a song would come out only when the sound is kept within the pleasant hearing range of healthy ears. Very many cases of hearing problem have been narrowed down to people keeping a piece of cotton wool inside the ear and forgetting about it. One can suffer lasting damage to the ear in this way. 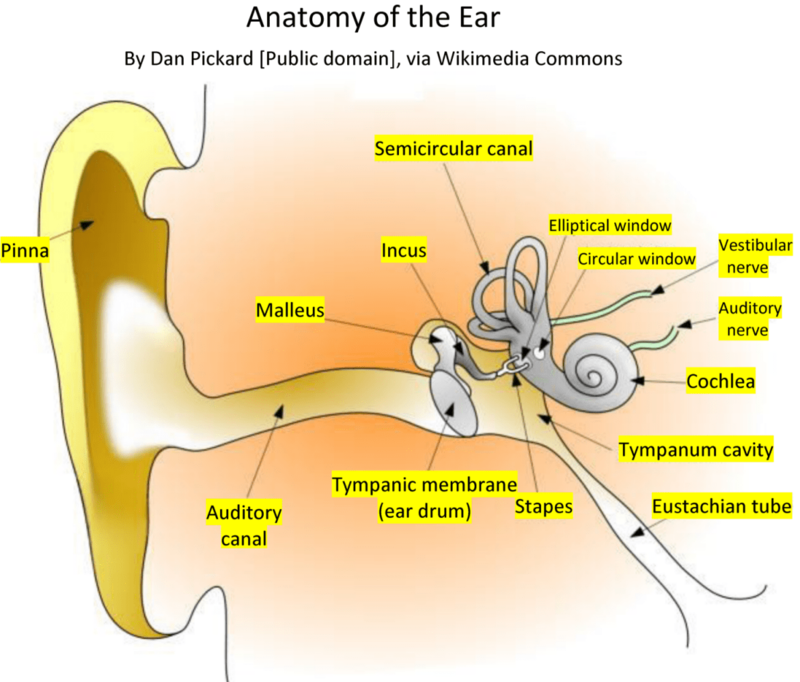 Ants or some other small insects (‘bugs’ in the US) that creep into the ear can cause terrible pain and may even damage the ear drum (diaphragm/tympanum). You should act fast. Pour salt water into the affected ear (Web Health Centre and other sources). It usually numbs the insect and makes it loosen the grip. It should come out with the water when you tilt the ear downwards. Medical intervention may be needed if there is difficulty in dislodging the insect. Children are notorious for pushing things into their ears. What is pushed into the ears could be anything that is narrow enough to slip in. So parents should take this factor into consideration when young children complain of any uneasiness in or near the ear. Medical assistance is needed to extricate the object in such cases, in order to prevent or treat damage to the ear. Our eyes are positioned inside the elevated bony sockets in such a manner that the eyes do not get injured easily. And then there is the nanosecond reflex of the eyelids, which shuts the eyes just an instant before any oncoming visible foreign object could reach the eye. However, we too must do our part to protect the eyes and prevent it from abuse and damage. All of us do know this fact, of course. However, to what extent we care for our eyes, wisely, is a big question. Before going into that let us take a look at the focusing mechanism of the eye. The lens you see in the above picture of the eye is made of soft transparent protein and its convexity is flexible. The extent of convexity of the lens is controlled by the ciliary muscles which stretch or flex the lens in nanoseconds in response to where the eye intends to focus. It is called accommodation of the eye. Click this short video to view how the ciliary muscles do the contracting or stretching of the lens. The initial focusing parameters of the eye are set by the axial length of the eyeball, the arching of the cornea and the extent of convexity of the lens in its relaxed state. If the range of axial length of the eyeball and the arching of the cornea are within normal range a normal lens will be able to bring into focus object in varying distances without any problem. This the condition of the eye when it is not able to focus on far objects. The increased axial length of the eyeball, the increased arching of the cornea and the difficulty faced by the lens in normal accommodation of the eye are known to contribute to myopia. One or more of these factors prevent the lens from bringing a focused image to the retina for interpretation via the optic nerve. Those having long-sightedness have difficulty in focusing on near objects. Reduced axial length of the eyeball and reduced arching of the cornea are known to contribute to hyperopia. This is the condition of the eye when there is more than one focal point within the eye because of imperfect shaping of the cornea and/or the lens. The condition is mostly genetic but may also set in later in life through an injury including an eye surgery. Since the eyes are very important organs, we must ensure that we have our eyes examined by ophthalmologists whenever we face any problems with the eyes. However, we must also learn to do what we can on our own, and also do our homework before approaching a doctor unless it is an emergency. Some of the common things we do unintentionally, which can harm the eyes and hence the eyesight are discussed below. You have a responsibility to make considered decisions. While specs and contact lenses are proven devices for eye care, you must take more than one medical opinion to ascertain whether your child’s vision can be corrected without the bothersome eye glasses. If your child comes under one such case where life-style changes, eye exercise and vitamins can take care of the problem, nothing like it. Go for it. Rubbing your eyes with fingers or hand could affect the tender tissues of the eye, especially the cornea. If a fragment of foreign object is the cause of irritation in the eye, rubbing the area would press the object against the delicate eye tissue and damage it. When you have pain or irritation in the eye, it is best to consult your ophthalmologist. Rubbing your eyes is also one efficient way to transfer conjunctivitis infection from your hands to your eyes or your eyes to others eyes. Since the screens of computers and TV have not reached perfection as yet, it is advisable not to sit in front of these for prolonged periods. For those who have to use computers for hours every day, a short break every hour is advisable. As for TV watchers, avoid sitting before it for hours on end. Watching several serials and advertisements every day will not only affect your vision, but also your personality and social life. Apart from the aesthetic value, teeth are essential for our survival because of their role in cutting and chewing food so that what we eat can be easily digested, partly within the mouth itself and the rest, in the stomach. Most of us enjoy at least seven pairs of teeth on either jaw in working condition. These teeth help us to cut, chew and grind the food that we eat. If we take care of our teeth, the teeth will take care of us. The first thing you should do to your teeth is to keep them clean. See brushing teeth in this website for additional information. Throat is largely made up of Pharynx (view picture of throat) and Larynx. 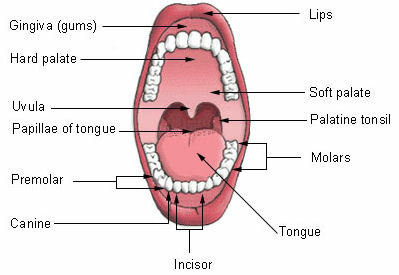 Other parts located within the geography of the throat include epiglottis, uvula and tonsils. Throat is one of the items in the human body, which is difficult to explain away with the theory of evolution. It is like a busy highway intersection that works smoothly without an overpass. It is essentially the junction box through which both air and food (includes water) pass to different destinations, one at a time. Both the air we breathe and the food (and water) we swallow first enter the pharynx. From here, the air goes to the lungs through the larynx and then trachea (wind pipe). But the food (and water) reaches the stomach through the oesophagus (food pipe). Click here to learn more about the difference between pharynx and larynx. The throat is one of the body parts known to people of all ages for the pain it gives for various reasons. The problems that affect the throat may range from simple and short-lived to prolonged and complicated. Here we address a few common throat ailments and explore what we can do about them. Sore throat, in other words, pain and soreness of the throat can be caused by physical (foreign objects) or chemical (corrosive substances) intrusions or ailments such as Pharyngitis, Laryngitis, Epiglottitis and Uvulitis. These throat ailments can be caused by a number of factors including allergy, virus and bacteria. For most throat disorders and what you can do about them, you may visit Throat Disorders from the US National Library of Medicine). Let us look at just a few types of common throat ailments. The following websites give easy-to-understand reviews of pharyngitis and what you should do when you are infected. The following websites give excellent reviews of laryngitis and what you should do when you are infected. What you can do for simple sore throat problems? The throat cavity has the tendency to retain some food particles even after the swallowing action, especially as people get older. It may be a tiny amount, but depending upon the type of food item lingering there, the residual particles are likely to act as breeding and proliferating grounds for unwanted germs that may cause/aggravate certain forms of throat infections and their consequences. Gargling to clean the throat is a good habit, hence this may be carried out every night after brushing your teeth. You may visit this site more information on the benefits of gargling. It is also advisable to gargle the throat clean after you have swallowed sour curds or sweet items during the day; but please do so without making it loud and disgusting. Common forms of sore throat exhibit painful inflammation and edema of the throat lining. When you gargle with fairly strong salt water, repeatedly, the excess water content of the lining where the bacteria are lodged, is drawn out through reverse osmosis thereby depriving the bacteria of a watery medium to proliferate. While there is no experimental data to back the use of this simple remedy, there are numerous satisfied users all over the world over the generations. You may also read this related article. Another article of interest is this. Consult your doctor when you have persistent throat pain, or you feel anything unusual about the throat. Since ear and throat are interconnected, even an ear infection can cause a sore throat. Most of the time, the problems of the throat are not serious, but only your doctor can decide that. Tonsillitis is inflammation of the tonsils, which are lymph nodes located on either side of the throat. The inflammation may be caused by viral or bacterial infections. Since tonsils are important for our health (they strain out harmful germs that enter the body), we should do everything medically possible to cure the infections. Removing the tonsils (tonsillectomy) is harmful, hence should be considered only as a last resort when nothing else helps and the merits of removing them are overwhelming. Do take a second medical opinion when tonsillectomy or for that matter any form of surgery is contemplated.